Do You Know How Hail Forms? Well, You're Probably Wrong. For many years it has been taught that hail forms by cycling in a thunderstorm, getting bigger and bigger until it was too heavy for the updraft. The rings in hailstones were thought to be caused by the multiple journeys up and down in the storm. However, this theory is wrong. Let me tell you what really happens. It shows a raindrop turning into a hailstone after circulating numerous times inside a thunderstorm. Eventually, this theory says, the hail gets too big and falls out. The most accurate parts here are the comments about the updraft existing and the hail falling to Earth. 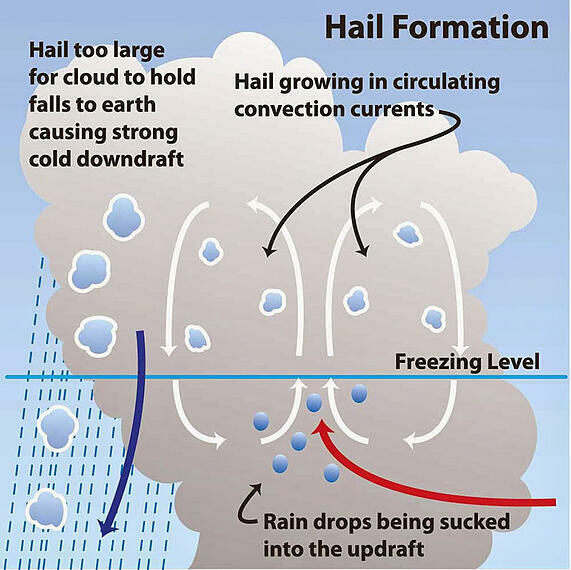 This idea of hail formation is now considered to be false. 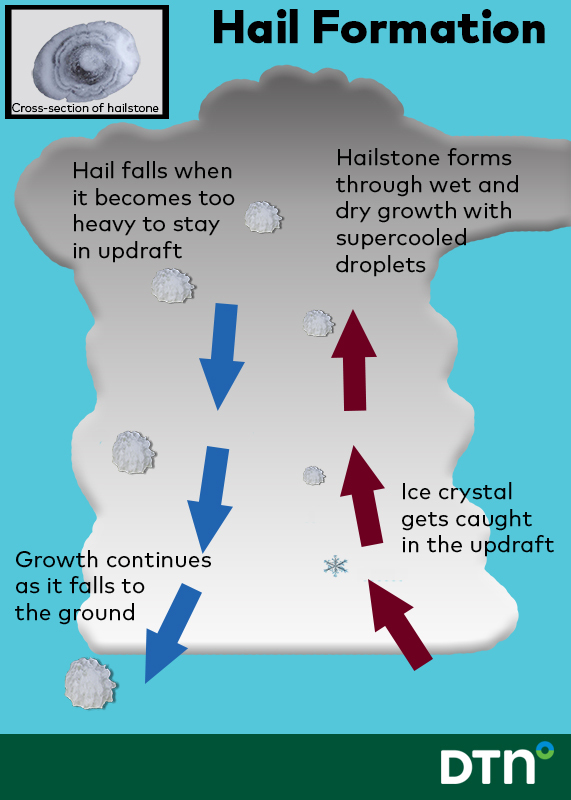 In reality, how hailstones form is entirely different. High up in a thunderstorm, the air is below freezing. The birth of a hailstone starts with a very tiny ice crystal. As this ice crystal gets pulled higher up into the storm, it begins to grow. This process occurs in two methods, known as wet and dry growth. Wet growth happens when the ice crystal meets supercooled water droplets. A supercooled droplet is one that has a temperature below freezing but is not in a solid state. As the ice crystal moves through this area, the droplets spread across it. This happens relatively slow, causing a clear layer of ice to form. Dry growth also involves supercooled water droplets. However, these droplets are even colder than those in wet growth. When the hailstone encounters them, it is similar to freezing rain hitting your car. Dry growth droplets freeze on contact with the hailstone. It happens so fast there is no time for air bubbles to escape, so they freeze leaving a cloudy appearance. As a hailstone ascends in a thunderstorm, it will encounter alternating areas in the storm of wet and dry growth. If in a slower updraft area, hail may rapidly grow because it has more time for the droplets to accumulate on it. If in a faster portion of the updraft, it may not have much time to grow at all. Latent heat, released as hail grows, causes the outer layer to remain liquid. Therefore, some growth will occur due to collisions with other hailstones. Eventually, the updraft can no longer hold the hail, and it falls back to the ground growing more through the same method as before.